The new roles will see trainees join the country’s largest team of telecoms experts working to expand, upgrade, maintain and install services over Openreach’s national broadband network. Speaking at the official opening of Openreach's new training school in Peterborough, one of 12 new regional fibre training centres to be built to support the rollout. Secretary of State for Work and Pensions, Amber Rudd said: "This is a huge expansion in high-skilled, well-paying jobs across the UK and yet another demonstration of the jobs success we have seen since 2010." David Jordan, Openreach’s Director - NGA - South, said: “We want people from all walks of life to apply for roles at Openreach, to build a diverse workforce that reflects the hugely diverse communities we serve. Last year we successfully recruited more women than ever before – and this year we want to go even further. 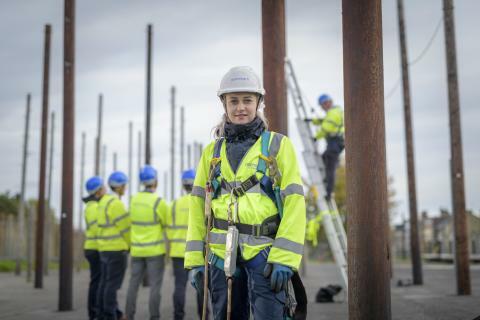 The new Peterborough training school is one of 12 similar regional centres being built or upgraded across the country and, after Bradford, it's the second facility to become fully operational under Openreach's multi-million pound investment plans, with three more due in the next twelve months.